ModuleWorks today announced that PTC has integrated the ModuleWorks High Speed Machining (HSM) kernel into its Creo® Mold Machining Extension to offer dedicated high-speed machining for the cost-effective production of molds and prototypes. Objects such as molds, tools, electrodes and dies only need to be produced occasionally, which makes them traditionally time consuming and expensive to manufacture. Specially designed to accelerate 3-axis and 3+2 axis machining, ModuleWorks HSM enables PTC to offer Creo users a solution to reduce development and manufacturing costs for one-off and low volume designs. ModuleWorks HSM is based on the industry-proven ModuleWorks 3-axis technology that uses mesh or triangle geometry to generate gouge-free toolpaths for 3D components. Multi-threaded for fast computation, ModuleWorks HSM offers the full range of flexible roughing and finishing strategies including intelligent adaptive roughing, rest roughing, flatlands and rest finishing. ModuleWorks 3-axis adaptive roughing comes with state-of-the-art features such as automatic start point detection and maintains a consistent tool load and smooth toolpath to significantly increase material removal rates, lower the cycle time and extend tool life. © PTC Inc. All rights reserved. 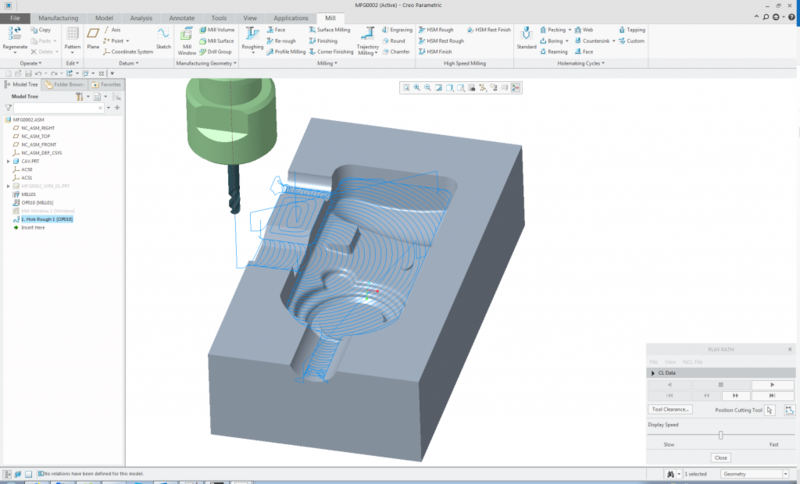 Creo Mold Machining Extension integrated with ModuleWorks HSM. This image shows the adaptive roughing cycle. PTC already uses the ModuleWorks component for material removal simulation, and this latest integration extends the ongoing and already successful collaboration to open up new opportunities in the high-speed machining market. “It’s very rewarding to see how the ongoing close cooperation between our companies helps PTC to continuously advance the PTC Creo technology and expand market opportunities”, says David Plater, Technical Director at ModuleWorks. “We look forward to a continued successful collaboration that further advances the technologies of both companies”. ModuleWorks is a software component provider for the CAD/CAM industry. ModuleWorks’ expertise in toolpath creation and simulation is recognized throughout the CAM industry and its software components and development services are used by the majority of the leading CAM vendors for sophisticated industry focused solutions across diverse business sectors. ModuleWorks multi-axis and simulation software has been used in the manufacture of complex parts for over a decade and they have many users across the global CAD/CAM industry.